Relatives can wait, must make CNY visit to Watertown showflat first! It's the second day of the Lunar New Year and while most were out and about visiting friends and relatives, hundreds flocked to the Watertown showflat in Punggol Central. The $1.6 billion project has attracted brisk sales since the launch on January 20, and 500 units out of 596 released have been snapped up (as at Tuesday 9pm). Buyers made sure they took time off from visiting relatives and friends to check out the showflats. A lady said: "We've done visiting already. So we wanted to do some shopping around for a house. The units have already been sold pretty fast, so we are trying to grab some opportunity and see if we can get some good deals before it gets fully sold." A man said: "This Chinese New Year, we had some spare time and I think the Watertown project is exciting. Punggol is an up and coming town to be in. Look at the vibrancy here! It's a great place to be here on Chinese New Year!" Another shared similar sentiments: "We took some time off from visiting friends and relatives just to take a look at Watertown because we thought we just come by and look at the showflat, and of course to check out the pricing as well." 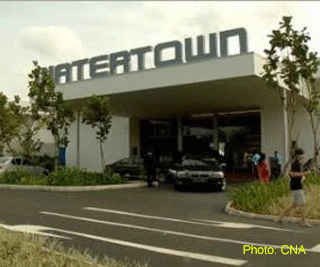 Watertown is the first integrated waterfront development in Singapore. It is situated directly above Waterway Point that will host popular shops, boutiques and Singapore's first basement cinema. The 992-unit development comprises Suites, SOHO apartments, Sky Patios and Residences and the price ranges from $980 to $1,500psf. 2 comments to ''Relatives can wait, must make CNY visit to Watertown showflat first!" It just demonstrates how rich Singaporean are, especially the younger generation. This is no wonder as they are natural benefit taker from rapidly growing economy, as well as government has transferred basis wealth in form of public housing to over 90% of citizens. Totally agree! In fact, ALL young or old Sporeans have benefited from spore's growth! Over 90% of the Watertown units bought are by Singaporeans! So stop blaming foreigners or PRs! Sporeans are rich! So is stamp duty rebate legal..? Kim Eng Research: Price correction by mid-2012? More new launches coming our way! Minister Khaw: En-bloc Fever Receding? Gong Xi, Gong Xi, Gong Xi Ni..! SSD: So who had taken the hit and bailed? Big slide in private home sales in December 2011! ABSD: More questions than answers...? SG PropConsult is open for business!